The DII Bone Dry Microfiber Drying Bath Towel is perfect for your fluffy friend. . Giving your pet a bath just got a whole lot easier. This can be used for any pet (small, medium, or large) you need to keep washed, cleaned, and dried. After a bath, a stroll in the rain, or fun in the pool, reach for this bone-shaped drying towel right away to get the job done. The pockets give you the ability to quickly run the towel up and down your pet and dry quickly. The microfiber material is extremely soft to the touch that your pet will appreciate just how soft it is. Microfiber is much more absorbent than cotton. Because of this, your towel is picking up more moisture on your pet. It will help dry your pet much faster than the standard towel, and the fact that they fit your hands will make the task much easier on you. 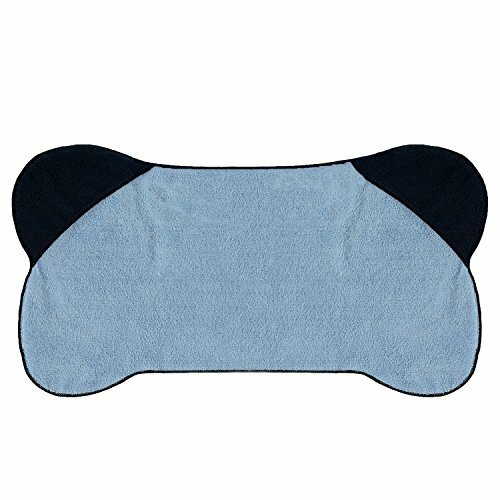 This drying towel is extremely absorbent that you can dry your pet from head to tail in half the time it would normally take. When all the drying is done, simply toss the towel in the washer to clean. Yes, this is completely durable and machine washable. Available in multiple color options, pick a color that best matches your pet’s style and personality! To view more of our products visit amazon.com/design-imports. PERFECT FOR ANY PET These drying towels are great for small, medium, and large dogs and cats to keep them washed, cleaned, and dried. POCKETS IN THE TOWEL FOR EASY GRIP This makes it super easy to dry off your pet after a bath or coming in from the rain. ULTRA ABSORBENT & FAST DRYING This will soak up moisture like a sponge and have our pet dry in no time. LIGHTWEIGHT & EASY TO STORE It can be stored in your car for on-the-go trips for your pet or at home. EASY TO CARE FOR Drying towel is extremely durable & completely machine washable for your convenience. If you have any questions about this product by Bone Dry, contact us by completing and submitting the form below. If you are looking for a specif part number, please include it with your message.